St. Moritz, Switzerland – While Thursday was sunny and warm at the FIS Alpine World Ski Championships in St. Moritz, the bright sun hid for most of Friday’s giant slalom race—proving chillier with tough visibility. 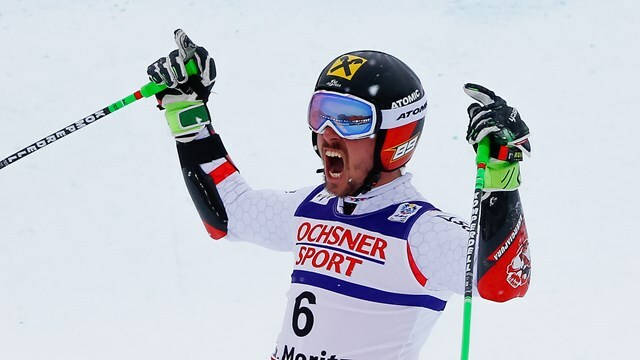 Many men struggled with the flat light and falling snow, but you couldn’t see that in Marcel Hirscher’s run, who, after finishing second to Ted Ligety in the last two World Championships giant slaloms and with Ligety out for the season, finally took his first GS gold today. Behind him by 0.25 seconds, his teammate Roland “Roli” Leitinger was second and Leif Kristian Haugen of Norway third. It is Hirscher’s second medal in St. Moritz, after taking silver in the alpine combined. It was the first ever podium of Leitinger’s career, whose best World Cup result is sixth in Soelden in 2015. He had yet to crack the top-10 this season. Haugen also enjoyed his first time in the limelight of the podium. Haugen finished fourth in the parallel GS earlier this season in Alta Badia and was also fourth in the Kitzbuehel slalom. David Chodounsky, of Crested Butte, Colo., was the top American in 11th. 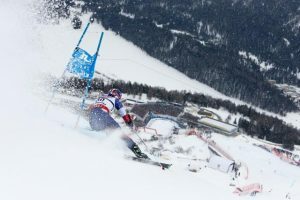 Known as a slalom specialist, Chodounsky put down the third-fastest second run in the GS, skiing with smart tactics and holding a clean edge on a difficult surface. He came down in a fit of excitement, with this result bettering all of his World Cup GS finishes. Ryan Cochran-Siegle, of Starksboro, Vt., was the only other American finisher to make second run, taking 25th. Both Tommy Ford (Bend, Ore.) and Tim Jitloff (Park City, Utah) did not finish first run. During today’s training of the PC-7 Swiss air team at 11:30 CET in the finish area of Salastrains, one of the planes touched the wing cam cable camera. This caused a tear in the cable, causing the camera to fall down. No one was hurt in the incident, and the plane landed safely at the regional airport in Samedan. For security reasons, the operation of the chairlift was briefly stopped. This caused the second run to be postponed by 30 minutes. The men have just one more event of the 2017 World Championships in St. Moritz: a slalom on Sunday. Chodounsky will be going for a top spot, fueled by his confidence in the giant slalom.